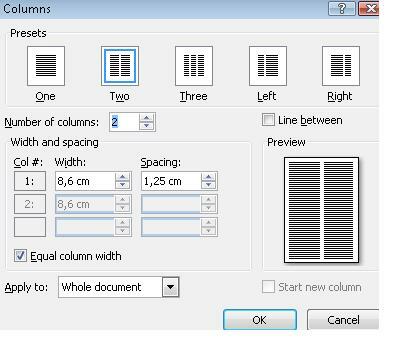 In Word, we can divide one page or an entire document into 2 or more columns. This is very useful when we are editing different kinds of text; it helps us visualize their content better. For example, people who write articles for magazines or newspaper usually divide their work into columns. This eases movement and focuses reading to a specific area. How do we divide into columns? 2. This will open up a menu with options and we select, for example, two columns. 3. We will see that our document has been divided into two columns in proportionally equal sizes. We can select any of the options presented as column division depending on our needs. We can also click on the More Columns... option. This will open up a new window with options. A very important function is that of Apply to. It allows us to select what portion of the document we will divide into columns. There are two options available: Whole document and This point forward.